Size matters? The smallest are the finest. Said cartoon character Obelix about peas and Romans. Rabbits there are from the greatest Flemish Giant to dwarf rabbits. The largest pumpkin or cabbage is each year in the local newspaper. What about the smallest vegetables? Which minis are there? And why? Cherry tomatoes we have come to know. Bonsai (decorative Japanese dwarf trees in a bowl) as well. Since 1870, there was in Anglo-Saxon countries spoken aboutf "baby cucumbers" and "small, white, tender baby onions", later baby lettuce and baby cauliflower, and eventually a whole range of cute plants. Like "primeur" wine, it boosts sales. It looks young, fresh, sweet and beautiful. La nouvelle cuisine in the late 1960s, used the miniature vegetables in modernist garnish: small, decorative, fresh and light. Carrot farmer Mike Yurosek had in 1987 the idea to reuse his twisted, deformed and discarded copies as baby-size snacks. He cut the broken carrots into cubes and coins, and presented them in snack capsules. And doubled its turnover. When visiting a known cannery in the 90s the CEO told us that especially Americans were fond of the cute little carrots. They thought it was a special kind. All with the same length, approximately 5 cm. And what sells well, is also produced. They were actually ordinary carrots that, already at harvest, in the ground, were cut to size. Then they are turned into a drum until the straight cutted edges were nicely rounded. It will meanwhile be no production or trade secret anymore. The more expensive (I almost wrote 'better'!) restaurants continue to look for specials to differentiate themselves. I have the impression that local wild harvesting is currently as attractive as exotic imports. But dwarf vegetables also are still wanted as decorative dressing. And TV dinners and lavish Western cooking programs bring the idea into almost all homes. And haute cuisine should be expensive, so mini vegetables are too. 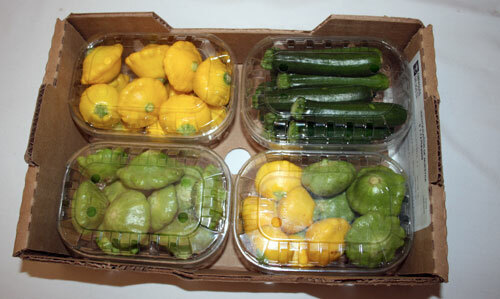 They are very small vegetables and fruits, which are obtained according to different principles. Sometimes they are just 'failed' products, which are very small. Not all fruits are the same size as standard. The Giants will be sold separately, but the mini too. Think e.g. about potatoes. The large potatoes are fries, or filled (on the barbecue). The little that used to go to the pigs are now being sold as baby potatoes. (Bingo). Sometimes they are very young and early harvested vegetables. Beets, onions, snow peas with hardly any seeds yet ... Immature harvested fruits are often pickled in acid as camouflage. And sometimes it is a post-harvest, for example small broccoli florets. But there are also seed selections to breed true dwarf varieties. These gnomes are just as nutritious as regular vegetables. And have sometimes tender and delicate taste, because they have a shorter growth period. At present there are in the United States about 45-50 species in the trade. The miniature size is their strength in the sale. A practical advantage, especially in a region with a short-summer period, can be the shorter growth and maturing time. Mini melons are very sweet and ready in just 60 days, while their standard big brothers still go on about a month. Golden Midget watermelon ripens in only 65 days. The cultivation of baby vegetables is identical to that of their larger counterparts. Because of their smaller size they take up less space and are grown closer together. They have little practical benefit except financial returns as long as there is interest and not too much competition. Trending has ups and downs. Maybe it's an idea for poor ground? Since the plants remain anyway smaller. It is not space saving, you put also because more plants per square meter. The shorter growing season can be an advantage to combine with a 2nd successive crop.